In 1976, the Viking Lander missions reported that Mars was a dead, rocky planet with no signs of life whatsoever. The ‘Face on Mars’ was declared an example of pareidolia - wishful thinkers placing a familiar pattern to nothing but a trick of the light. But in more recent years scientists have accepted that there was once flowing water on Mars, even plate tectonics. So, if Mars was once much more Earth-like than we have been led to believe, what forms of life could have existed there? Is it possible that there is life on the red planet, even today? 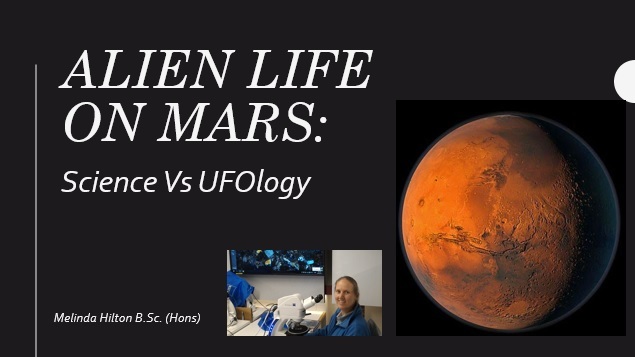 In this talk, Melinda will be examining some of the more ‘alternative’ evidence for the case of life on Mars, including ancient mythology, some alien abduction stories and details of remote viewing – some of only which have only recently come to light. Melinda Hilton, B.Sc. (Hons) is a researcher and writer. Her interests include planetary colonisation, alien hybridisation, human ancestry, and archaeology. By applying a scientific approach to alternative findings she has uncovered many holes in mainstream academia. A believer in universal knowledge (sometimes called the "god source") and telepathic communication, she asserts that the ET presence on Earth is real and there is much for us to learn. She is currently undergoing postgraduate studies in environmental geochemistry at university. Entry: UFORQ Members: $10 Non-Members $15. Eftpos available. undercover car park directly below the library.